German artist Julius Popp uses technology to create work that reaches across the boundaries of art and science. Three of his works, Bit.fall, Bit.flow, and Bit.code are pictured above. Bit.fall is an installation that in some cases displays images and, in others, words selected from the internet via drops of falling water spurting out from 320 nozzles controlled by computer software and electromagnetic valves. In Bit.flow Popp pumps liquid into a 45-meter long tube on a wall. A software program sets out a pattern which only at certain points forms readable forms or letters which then disintegrate into chaos again. Lastly, Bit.code is made up of plastic chains with black and white pieces which act as pixels. 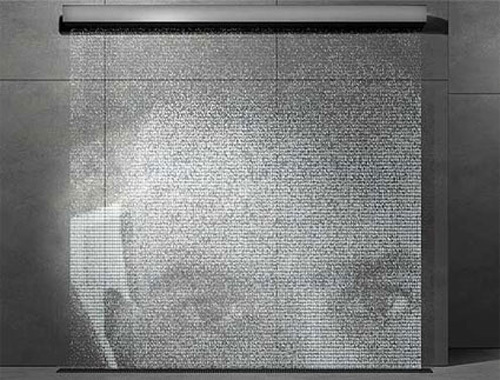 Controlled by computer software, the pixels move next to each other displaying frequently used key words, at certain points, taken from recent web feeds. All three appeal to me, yet are definitely appreciated more in person. The videos of each below are the next best thing, unless you are in Jerusalem, in which case you can see Bit.fall in the current exhibit Curious Minds at the Israel Museum until April, 2012. Elements of these installations bring to mind Daniel Rozin’s work (see post) and Christopher Baker’s Murmur Study (see post). 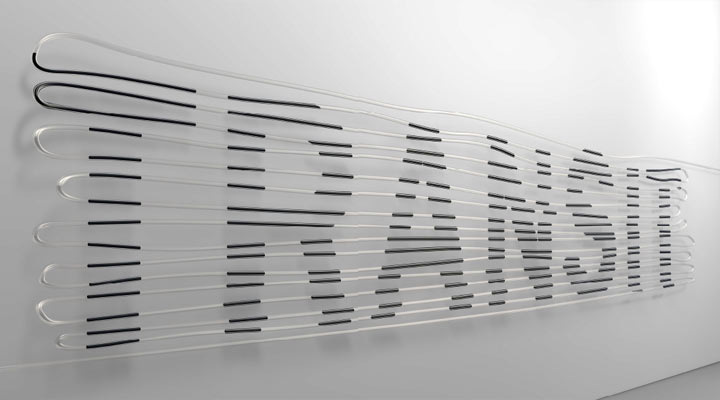 This entry was posted in Art, Interaction Design, Just Plain Cool, Stuff We Like, Typography. Bookmark the permalink.